Delivery timescale for this outfit is 7-8 weeks from the receipt of the payment and provision of final measurements. Please contact customer service if you want rush delivery. 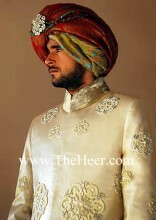 Off-white sherwani in cool and comfortable PC Polyester cotton fabric. Small and bigz size ornamental motifs is decorated throughout. Comes with Off-white kurta and shalwar.Made in Pakistan. Click the button below to add the SW508 Off White Polyster Cotton Sherwani to your wish list.